It’s been 19 years long journey and still counting years of togetherness and the spark in Ajay Devgn and Kajol love and relationship is still alive. We cannot find Ajay Devgn and Kajol publicly displaying the love in front of the paparazzi or public. Still Ajay Devgn and Kajol are the most sorted couples of Bollywood who share everything and support each other. Ajay Devgn and Kajol’s married life has given goosebumps to many as they both are cheese and rock in personality. Ajay Devgn and Kajol are unlike pairs who are attracted towards each other and are growing old together. Their perfect understanding has made them the most perfect couple. Kajol is fun loving and confident lady whereas Ajay Devgn is shy and strong man, which makes them opposite. Ajay Devgn and Kajol relationship would not last long was many people’s verdict but it grew up so beautifully. Public criticise their relationship but they gave a strong answer to all by standing together. Kajol is the chatter box whereas Ajay is the sophisticated man who is quite and introvert. But feeling all the rumours aside they got married after a four year long relationship. Their commitment to stay together is still counting and they are regarded as one of the strongest couple of B-town. Facing all the media speculations they came out to be the perfect couples with opposite personalities. They married in the year 1999 in true Maharashtrian style. Ajay being a shy personality wanted to have a private marriage without the interference of media and Bollywood. All the camera persons were also his personal peoples, he did not even hired any professional. After marriage they flew to Europe on a 2 months long honeymoon. Ajay Devgn and Kajol together over come all the controversies and handle their relationship beautifully. They believe that their difference complete and complement each other. 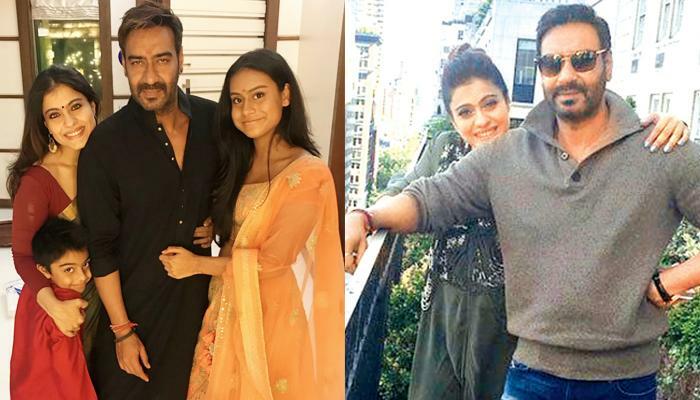 Ajay Devgn and Kajol marriage faced lots of hardships and challenges, their were rumours that Kajol is not a good daughter-in-law and Ajay is going through extra marital affairs. They had a long testing times where they were busy proving their relationships to peoples. Kajol also went through a miscarriage during her first pregnancywhuch shattered all their hopes and dreams. But they stood beside each other strongly and decided to take a second chance. Ajay Devgn and Kajol got to experience parenthood second time when their beautiful daughter Nysa was born and after 7 years they gave a birth to a boy. Since then they gave first priority to their kids and are very affectionate towards them. Their kids are their weakness and strength. This defines that love is not just to say I Love You but to feel it without saying. We can defend our love by standing strong and support each other in all ups and downs.